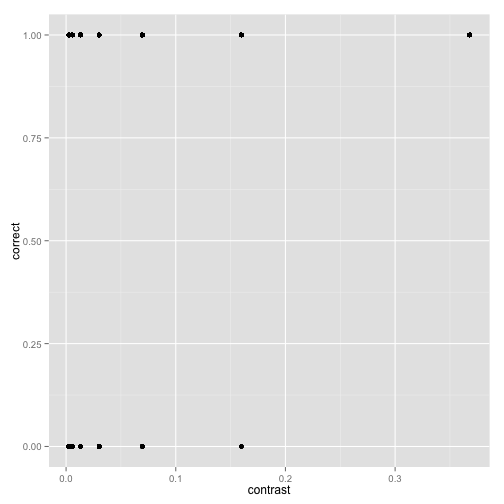 If you have read my older blog posts, you know I’m a fan of R’s ggplot2 library for exploratory data analysis. It allows you to examine many views onto data, creating summaries over different variables right there as you plot. I gave a short tutorial here. Once you understand how the library works, it’s a very powerful way of quickly seeing patterns in large datasets. The past few months have seen me ramp up my Python useage (as I preempted almost a year ago). This is for a variety of reasons, but mostly (a) Python is a general programming language, so you can essentially do anything in it without it being a massive hack; (b) the scientific computing packages available for Python are generally super awesome; (c) it seems to me to be poised to replace Matlab as the lingua franca of neuroscience / vision research — at least, much more so than R. See Tal Yarkoni’s blog for a related discussion. Of course, it’s also free and open source. What I’m still kind of missing in Python is a nice high-level plotting library like ggplot2. 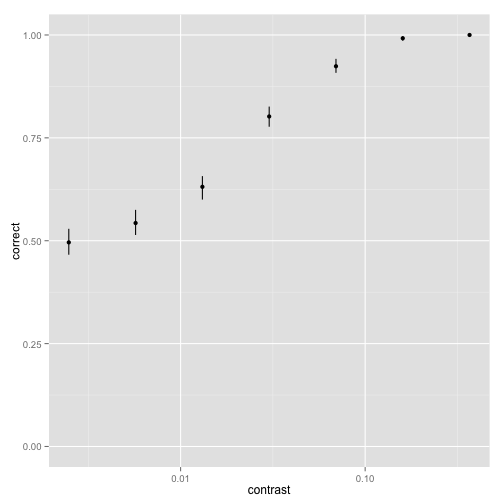 Certainly, there are many in the works, but in playing around I’ve found that none of them can match R’s ggplot2 yet. Of the libraries I’ve tried (main competitor is yhat’s ggplot port), my go-to library for plotting in Python is hands-down Seaborn. 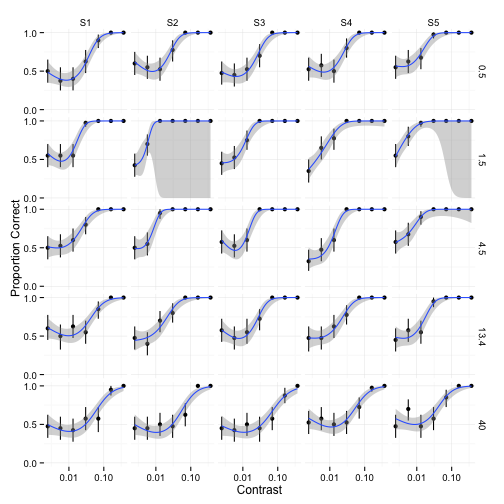 Developed largely by Michael Waskom, a graduate student in Cog Neuro at Stanford, it has the prettiest plots, and also the best ideas for high-level functionality. Unfortunately, compared to R’s ggplot2, Seaborn data summary functions are slow. As an example, I’ll show you a summary plot using the simulated data from my R tutorials. (note that the above lines were run in an ipython notebook, hence the %%timeit magic operator). Note also that both packages are doing 1000 bootstraps by default (as far as I’m aware), so I’m pretty sure they’re doing equivalent things. This is obviously not a positive factor for my switch from R to Python, and I’m hoping it’s just that I’ve done something wrong. 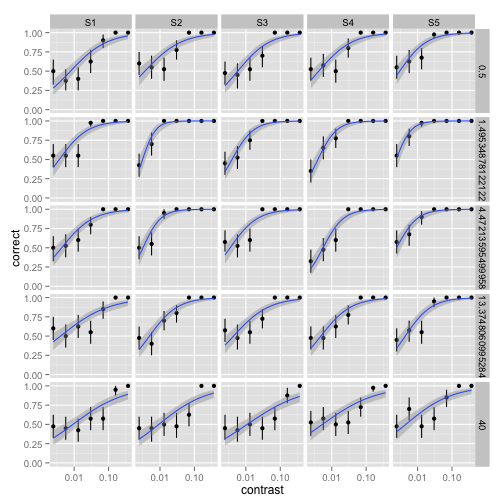 However, another explanation is that whatever Seaborn is using to do the bootstrapping or logistic model fitting is just far less optimised than ggplot2’s backend in R.
The nice thing about open source software is that we can help to make this better. So if you’re a code guru who’s reading this and wants to contribute to the scientific computing world moving ever faster to Python, go fork the github repo now! After I posted this, I opened an issue on Github asking the developers about the slow times. Turns out that the ci flag in sns.lmplot specifies confidence intervals for the logistic regression, which is also bootstrapped. 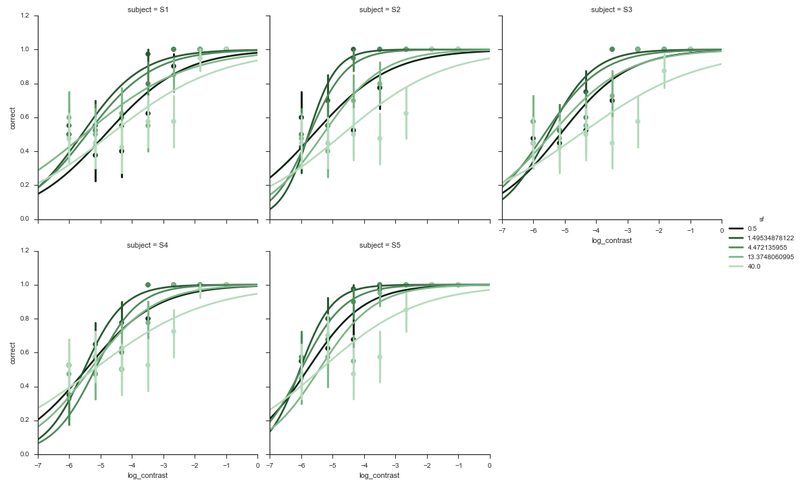 Bootstrapping a logistic regression takes a while; setting ci=False means that Seaborn now takes about 7 seconds to produce that plot instead of 2 minutes. So, hooray for Seaborn and for awesome open source developers!